The Minuteman International group of companies is a brand of commercial, industrial, and chemical cleaning products. Minuteman International produces a vast product line ranging from carpet extractors, warehouse sweepers, to graffiti remover. Minuteman vacuums represent top-notch filtration, offering HEPA vacuums for residential allergen control, and sometimes going above and beyond HEPA standards with Ultra Low Penetration Air (ULPA) filtration in their critical vacuum systems. ULPA filtration removes up to 99.99% of impurities at 0.12 microns and larger, while HEPA filtration is 99.95% efficient with particles down to 0.3 microns. 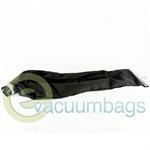 Minuteman vacuum bags are an important factor in achieving the maximum filtration capabilities of your Minuteman vacuum. Minuteman offers double-layer disposable paper bags for 99% efficiency at 5 microns. These disposable paper filter bags would be used for dry bulk refuse. Minuteman also manufactures bags using a blended fiber technology. This includes Minuteman’s non-woven, polyester filter bags that can provide 50% more filtration area than a standard vacuum bag. The embossed polyester filter bag filters impurities as small as 1.5 microns with 99% efficiency. Minuteman Flouropolymer HEPA filter bags, made with Teflon, remove particles at 99.97% efficiency down to 0.3 microns. Hako / Manual Minuteman CC-3 Pile Lifter Shake-Out Outer Cloth Vacuum Bag for Hako / Manual Minuteman Model C25120 Vacuum Cleaners. 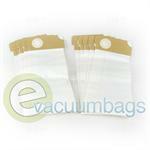 Hako Disposable Paper Vacuum Bags for Minuteman MPV C37115-14 and 18 Upright Model Vacuums. 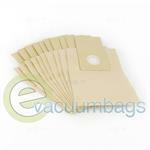 Hako Paper Vacuum Bags for Minuteman MVP C3711514, C3711515, C3711518 Upright Model Vacuums.